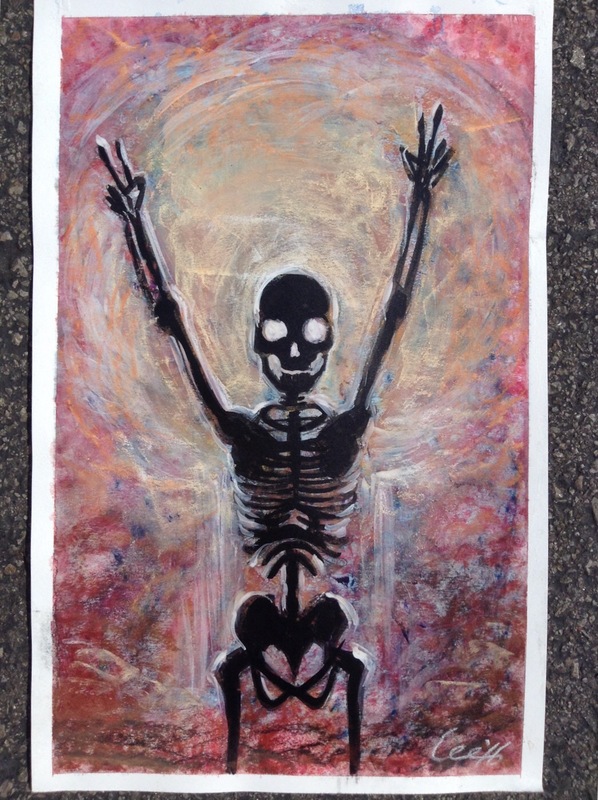 Three years ago I created a piece titled “Atomic Peace.” link here. This is a follow-up of that, three years later. As you can see here now the figure has been decimated to a skeleton, a result of the extreme exposure to the nuke. Now I don’t know if one can really be reduced to dust from the blast, but we’ve seen plenty of movies and tv specials that depict the devastating impact of nuclear explosion, and it’s quite possible we will one day witness the phenomenon in real life. With the Trump in power and his unstable fingers on those nuke codes, and other countries like Iran and North Korea amping up their nuclear activities, it could only be a matter of time. This piece is a roll back to the mixed techniques I had used back in ’13, using layers of pastel and charcoal over an underwash of watercolor, and the focal figure drawn in ink. I’m constantly experimenting with different medium and techniques and I probably mentioned that I’d be hopping back and forth between them. I’m not the type to stick to one medium or technique my whole life, I need to change it up. I’m a tramp, a big tramp, and not ashamed of it. I get that from Picasso, who’s also said it himself that he will never be tied down to one place. And I’ve since thrown down associating my art with any particular art genre or style, because, well, I don’t know what to call my art, and I don’t give a (beep). The piece reminds me of a baby in a womb. Very beautiful. Always great to hear from you, Lisa! This is wonderful! Go with your gut…always.